The idea of Western Dressage began in 2007 when a few prominent trainers met and began to discuss horses, training techniques and concerns of where the western performance industry was going. They realized that there were some core concerns shared by everyone and there was also a similar theme in the training of the successful horses, being the use of classical dressage techniques to train the western horse. How ever there was no format or central gathering point where by riders who wished to compete on their classically trained western horses could go. Hence in 2010 the Western Dressage Association of America (WDAA) was formed. The Mission of the WDAA was to honor the horse and its rightful place as a symbol of the American West, value the partnership between horse and rider and welcome all breeds of horses and levels of riders to enjoy the journey of developing harmony with the horse thru correct training. Many horses fail to become suitable mounts due to mistakes made along the training path. This path is one that benefits from the understanding and practice of Classical Dressage. Although Classical Dressage techniques have been used by top western horsemen and horsewomen for many years, until now there has never been an organized effort to give that combination a name and recognize it as its own discipline. The WDAA has now done that in the hopes that many more horses and their owners/riders will benefit. Inclusiveness is important. Western Dressage is a discipline which invites any breed that can walk, trot, and canter to participate. From top competition horses to recreational trail horses, training methods which utilize Classical Dressage on western horses improve that horse and also helps to develop a rider who is in harmony with their horse and has an empathy for their wellbeing. 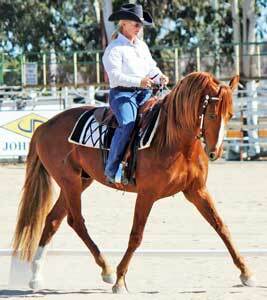 Western Dressage offers many entry levels. The beginning rider can participate in an atmosphere which is both inviting and non-intimidating. The rider who comes in at a more advanced level can learn to perfect her or his horsemanship and training method. The precision of Classical Dressage encourages more advanced riders to perfect their techniques, turning their horses and themselves into improved performers. This multilevel entry and advancement opportunity provides a place for every rider and every horse to become a success story. In 2013 Linda Shore presented Western Dressage at Equitana Australia to begin promoting it to the Australian riders and it was well received and saw the development of a few small groups and associaitons becoming affiliated with the WDAA to begin holding western dressage competitions in Australia. 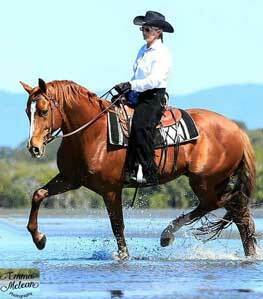 In 2014 American coach Lynn Palm was invited to present a masterclass at Equitana in Australia and Linda Shore traveled down with the Morgan stallion RanchBoss Cortez to be a demonstration rider at this. In 2014 the Western Dressge Association of Australia was formed and the discipline has continued to grow slowly from this with branch affiliates now established in Queensland, Victoria and Western Australia. In 2017 a number of major breed associations in Australia will formerly recognise Western Dressage as a points approved discipline. This includes the Australian Quarter Horse Association who, for the first time, will have a western dressage competition included in their National Championship. Linda Shore formed a small club in the Toowoomba area called Darling Downs Western Dressage Inc to promote western dressage in her local area and often runs western dressage competitions along side english dressage competitions run by local Equestrian Australia affiliated clubs. DDWD is about to embark on it's third year of competition and membership and support for the discipline and club continue to grow. If you would like to learn how you can get western dressage started in your area please contact Linda for more information. I get asked many times why a rider and coach who has always competed and trained in conventional English Dressage, including competing successfully up to Grand Prix would begin enthusiastically promoting, coaching and competing in western dressage. Now don't get me wrong I thoroughly enjoy training english/classical dressage, although in general I just really luv training dressage with my horses in the persuit of achieving perfect harmony and lightness of riding that is enjoyed by both me and my horses. However I found I was getting penalised in my english dressage classes for my horses being TOO light and NOT forward enough, especially when I was competing on the superb morgan stallion RanchBoss Cortez. I also had many students who trained and competed dressage on horses who's natural conformation and biomechanics did not allow them to travel powerfully forward and have a long over step from the hind quarters, so they too were getting penalised for not fitting the requirements that the bigger moving warmbloods did easily, albeit sometimes with not very good relaxation, lightness and harmony with their riders. It started to seem that many breeds of horses in english dressage are too often penalised for what they CAN'T do rather than rewarded for what they CAN do. Thru the Morgan horse connection I started to hear about the developing discipline of western dressage in America and started researching and the more I looked into it the more I was excited about the possibility of bringing this discipline to Australia and being able to offer a discipline and training to Australian riders who wanted to train and ride dressage but had become disallusioned because no matter how well their horses performed within their ability they were never good enough. The mission of Western Dressage to honor the horse irrespective of the breed is confirmed in the discipline's rules where it states that emphasis is placed upon the harmony of the partnership. Correct lightness is rewarded and relaxation of the horse is paramount. A horse who is physically incapable of tracking up with the hind legs in trot/jog is not marked lower than the horse who can track up provided it is working correctly over it's back and following the contact without resistance. This for me is what I am always aiming to achieve with both my own horses and my clients and students horses, a relaxed horse that is working to the best of it's ability and is light to the contact while being responsive and willing to try for it's rider. I train my western dressage horses and my english dressage horses exactly the same with only a few minor differences in equipment, impulsion and contact and currently have several horses who compete in both disciplines. However the fun and comraderie that I feel when competing western dressage currently give me far more enjoyment than the serious formality and competitiveness that surrounds an english dressage competition. 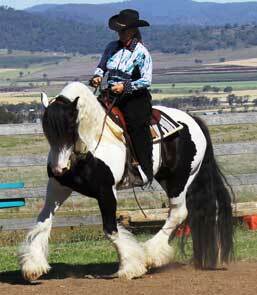 I believe that western dressage fills a need in the equestrian community in Australia. Especially for those riders who ride more for enjoyment than competition but still want to continue to improve their knowledge and skill to be able to try a wider range of disciplines without compromising their horse's well being. Also there are a large number of riders who prefer the security of riding in a fender style saddle, be it western or stock, and have no desire to trade their comfortable jeans for tight jodphurs and hence western dressage suits them as an alternative. The other great thing about western dressage also is that no fancy equipment is required. Good quality working western/stock style equipment and apparel is all you need so it is also a discipline that fits a wide variety of budgets. I believe western dressage as a discipline is here to stay and it will continue to grow in support and popularity around the globe. I certainly believe in the positivity of the discipline and will continue to enjoy training and competing it as well as helping riders and horses achieve their goals with their equine partners. So one of the main questions I constantly get asked about western dressage is "what is the difference between the two disciplines other than equipment". Certainly I hear many comments that western dressage is just english dressage in a western saddle. While this is somewhat tru in that the arena size and markers are exactly the same for both and many of the movements and exercises are the same, there are definitely difference. The tests describe the paces of trot and canter slightly different in that the trot if referred to as Jog and the canter referred to as Lope. The quality of the paces and purity of the paces required is the same as for english dressage in that the horse is required to travel with rhythm, elasticity and relaxation of the back thru all 3 basic gaits of walk, jog and lope. There is impulsion but it is softer than that seen in english dressage. The horse is also required to show various tempos within the paces such as collection, working, lengthening and free or long rein stretch. The frame of the horse is mean to reflect it's level of training in that the lower level horse will travel in a longer lower frame and the higher level horse will travel in a shorter more up hill frame. However the at all levels where possible the poll is required to be the highest point, except for free walk and free jog where it is required to lower towards the ground. The horse's nose is required to be on or slightly in front of the vertical where possible. Excessive overbending of the neck and nose is heavily penalised. Much of these "frame" requirements are the same as for English dressage. The main difference for me is in the level of contact and impulsion between english and western. 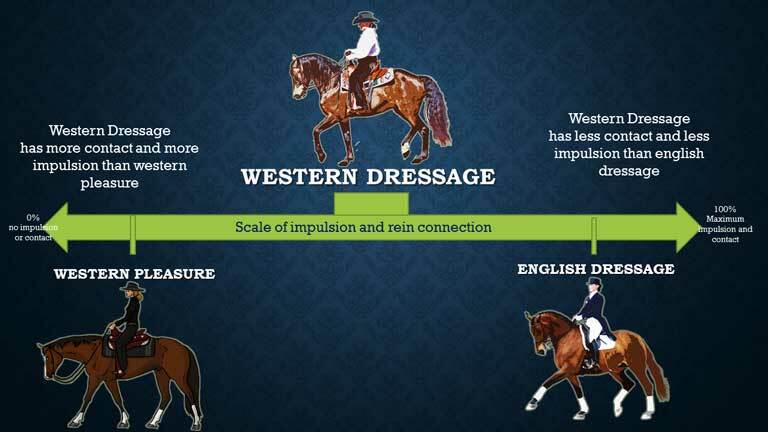 Western dressage has a lighter contact than english dressage and western dressage has a 'softer' level of impulsion than the more energetic and powerful impulsion required for english dressage. The best way I have found to describe the difference between western dressage, english dressage and western performance/pleasure competition is with the graph below. Movements such as shoulder-in, travers, renvers and halfpass are ridden with the same training requirements as they are in english dressage. Turns on the forehand and haunches are able to be ridden either as a pivot foot or marching foot provided the movement is excuted correctly in it's relevant form. Reinback is required to be the same diagional pair foot falls as for english dressage, however some of the reinbacks in Level 3 of western dressage are 12 metres in length and hence are much harder and the horse is required to maintain it's rhythm and straightness and not rush in this. 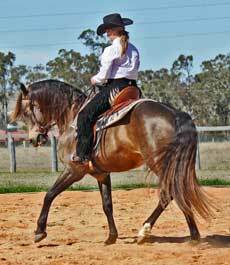 Linda conducts clinics around Australia to introduce interested riders to western dressage. These clinics can be in group ride format or private lesson format and can include theory and power point presentation as well as the opportunity for participants to ride tests and be judged and receive feedback at the end of the clinic. If you are interested in having a clinic on this in your area, anywhere in Australia, please contact Linda . 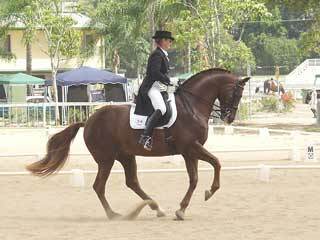 There is now a National association in Australia for Western Dressage. If you are interested in setting up a club or group in your area to conduct western dressage competitions the National Association can give you a lot of assistance to get started. Darling Downs Western Dressage Inc.
All the performance horses at RRWS & D2BS are prepared for competition using Hyfeed's excellent products and we are very please with the results. Interested in having your products promoted Australia wide to either/or English, Classical or Western dressage riders. Contact us to discuss options of sponsoring Linda Shore to promote your products. East Greenmount Qld 4359 Australia.